Claudio Gonzalez (left) and owner Joe Besecker. Photo by Jim McCue, Maryland Jockey Club. 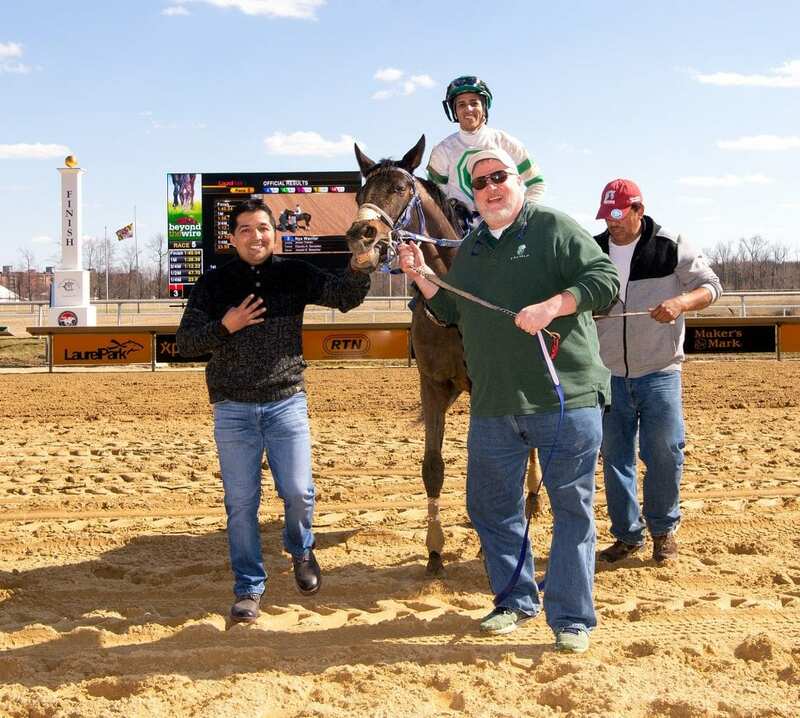 Joseph Besecker’s Nyx Warrior ($16.80) came with a steady rally on the far outside to edge Moon Virginia at the wire in Sunday’s fifth race and complete a perfect afternoon for Laurel Park’s winter meet-leading trainer Claudio Gonzalez. Gonzalez won with each of his starters Sunday, taking four of the first five races including three in a row. His other victories came with Dr. Cerrato ($10.20) in Race 1, Cool Alley ($4.60) in Race 3 and Belmont Ride ($11.40) in Race 4. Nyx Warrior, Cool Alley and Belmont Ride are all owned by Besecker, the founder, chairman and CEO of Lancaster, Pa.-based Emerald Asset Management, parent company to five subsidiary investment advisory firms. Gonzalez leads the winter meet with 36 wins and nearly $900,000 in purse earnings. On Saturday, he won Race 4 with Completed Pass ($13.80) and Race 6 with Dynamax Prime ($15.60), and was third with Tybalt in the $100,000 Private Terms and second with Rockinn On Bye in the $75,000 Not For Love. His 36 wins are three times as much as any other trainer; Jamie Ness, Jeremiah Englehart, and Hugh McMahon are tied for second with 12 wins apiece.